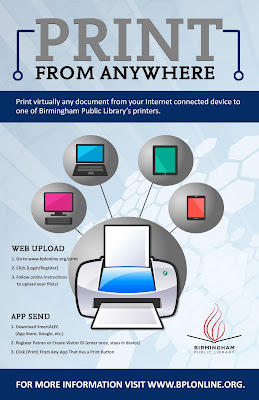 The Jefferson County Library Cooperative (JCLC), which includes all 19 Birmingham Public Library locations, is offering a new web-based printing service in all 40 member libraries throughout Jefferson County. Patrons using their JCLC member-issued library card inside their library will be able to use an online printing service called SmartALEC to conveniently print from their own laptop, desktop, smartphone, or tablet to designated print release stations. The online service allows a patron to send documents to print at the library from anywhere the patron has Internet access—from home, work, inside the library, and other places with WiFi. There is a nominal library fee to print out documents. To begin, patrons need to register by visiting and uploading their documents at this link. After the print job is submitted, the patron can pick up the printed items at any of the 40 JCLC locations. To login, enter your Library Card number and personal identification number (PIN). If this is your first time using the service, click on the "First Time User" button and register. Once set up, patrons can use SmartALEC anytime their device is connected to the Internet inside their favorite JCLC or BPL library.